Besides Publix, where else do you do your grocery shopping? 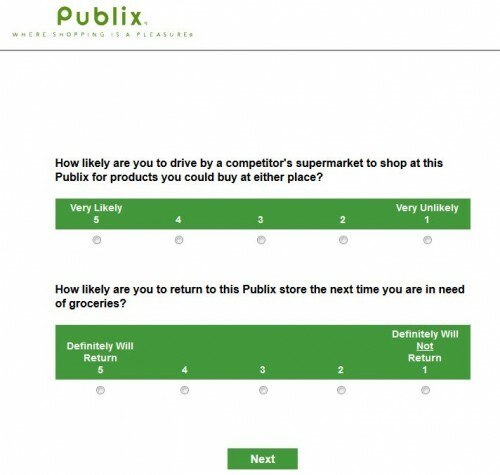 Recently, Publix is giving away 10 gift cards each valued at $1,000 in Publix customer satisfaction survey sweepstakes. Are you in the market for $1,000 in groceries? Entrants in Florida, Georgia, Alabama, South Carolina, North Carolina, and Tennessee are eligible to receive one entry by completing the Publix online survey to win free groceries for months! 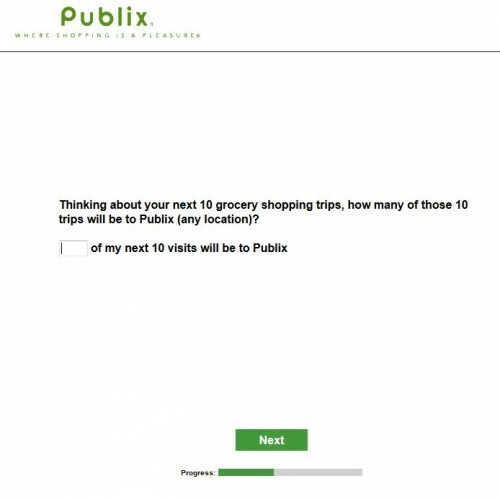 Share your shopping experience with Publix right away. You need to go to the survey page (See Reference Link 1) and complete this survey. Do not fill out the survey in the screenshots below. This survey will take about 10 minutes to complete. Select a language from English and Spanish to take the survey. Enter the 4-digit store number located at the end of your survey invitation. Before you take the survey, enter your 10-digit telephone number so that you will be contacted once you win the sweepstakes. Select which grocery store you visit most for groceries. Rate your overall satisfaction with this store where you receive the survey invitation. Can this Publix be the only store you want to shop? How much does your household spend on grocery each week? 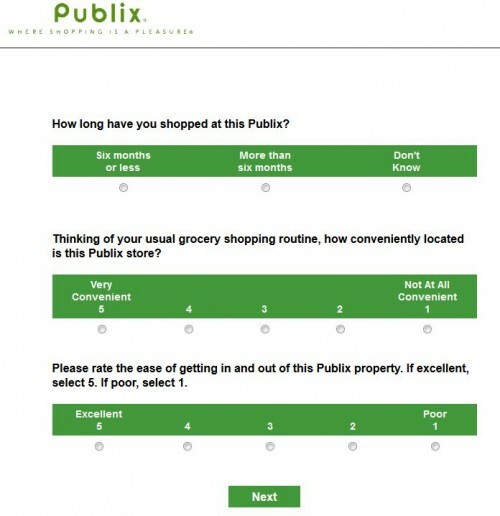 Rate this Publix in several aspects. Indicate your age, gender, annual household income, etc. and enter the sweepstakes drawing to conclude the survey. Publix Super Markets currently operate in 6 states, providing food and pharmacy services with some of the stores featuring cooking schools, sushi, charging stations, liquor and cafe. 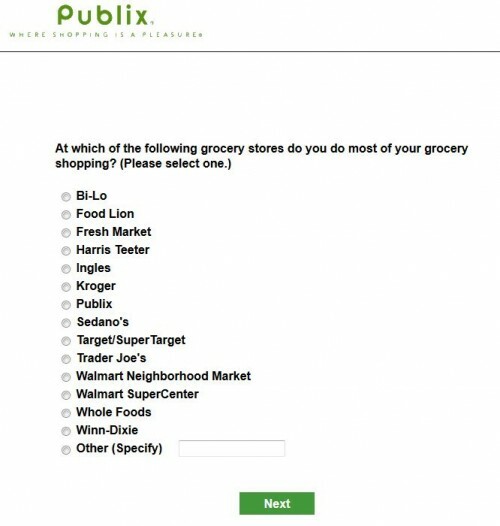 Publix is one of the largest US grocery chains “Where Shopping is a Pleasure”. It has a whole line of Publix brand products that’s on sale from time to time. I have been a Publix customer for many years, however, yesterday’s experience has not only soured me on your products, but prompts me to write this message. On the evening of 04/18/2018 I purchased several deli dinner items at Tampa’s, Westchase store. This included 12 oz. and 16 oz. containers of your pre-prepared deli chicken and rice soup. My wife later brought to my attention the inclusion of a dead, alien worm like creature found in her soup. I subsequently, threw away my portion of soup and brought the worm specimen to the attention of Lewis Bradham, Store manager. He expressed his concern, accepted the dead specimen, refunded the cost of the soup and assured me he would follow up on the matter and contact me the following day. It is now the evening of the following day and I’ve heard nothing concerning this matter. Perhaps I should post this situation to social media. I love Publix, their customer service is outstanding. I have a Kroger by my house, super close to me, but I rather go an extra mile just to go to Publix. I love Publix and their employees, the time and effort I take to go there is nothing in comparison to their service. They are always polite, helpful in any way and will go out of their way to help you find what you need. Awesome store with great employees. Very clean and everyone greets you every time. I have tried 3 different times to enter this survey online as I usually do. 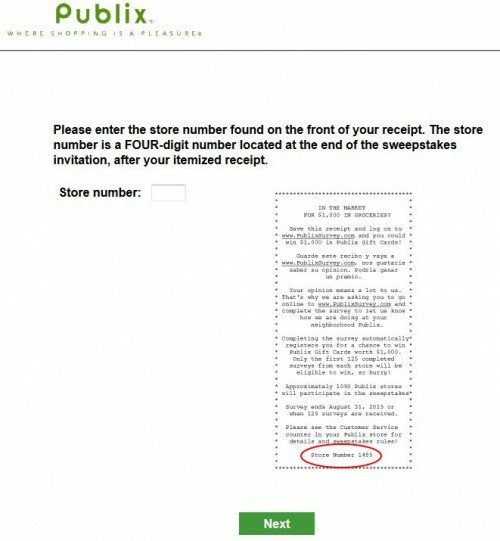 The info requesting store # survey code # and time stamp doesn’t work. I reported this a couple weeks ago to no avail even though they emailed me they would investigate & get back to me which didn’t happen. I shop Public only and go there 3x a week. Any suggestions? I love shopping in publix store . Is always a pleasant experience. Least four times in a week. Siempre encuentro lo que necesito, además de el excelente servicio. Very clean. Customer service is impeccable! Including the pharmacy. Friendly, clean and easy to find what you are looking for. After a long day at work…it was a pleasure to see smiling faces. We were in and out in no time. Thank you for your great service. This is why we shop here every week. Please have advertised items readily available at all times instead of a receipt to get it when its back in stock evwn when its the first day of your sale. I wanted to add before that your poll should include another answer: “As Yet Un”ederminedt. Or, something to the effect, that it’s really an international issue, not one neither Japan nor ROK should decide unilaterally. Publix has the best customer service and the most friendly staff, in Weston, Florida. I have been a loyal shopper for over 15 years. This is one of the worst places to shop in America! The selection of food, oh so limited and boring. The produce taste like plastic, like they are soaked in chemicals and floor polish. Your employees are obviously undertrained and they’re rude! One man employee was so busy looking at his phone, that he ignored me. The milk cartons were dirty, and the floor had tobacco spit on it. Nasty! I wont be shopping here anymore! Publix is the best place to shop. Customer service is awesome.